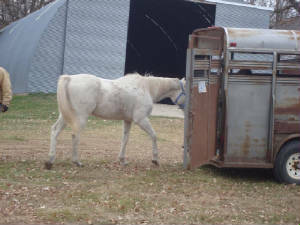 Horses in rehab 2010. 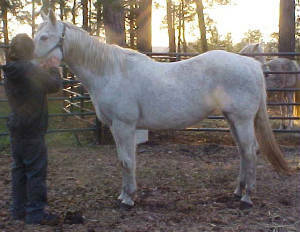 This page contains horses that we currently have in or have rehabilitated this year. 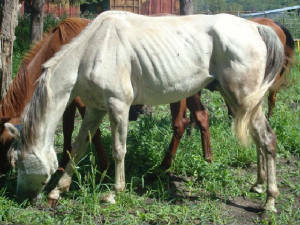 If you'd like to sponsor one of the horses in rehab please contact us. 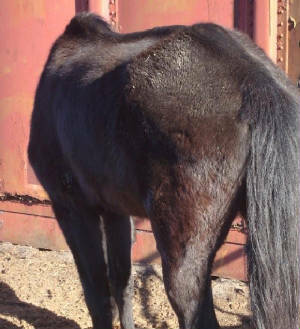 And if you'd like to donate anything for the care of the horses listed below, Sr. feed, alfalfa cubes and shavings are always welcome and greatly appreciated. 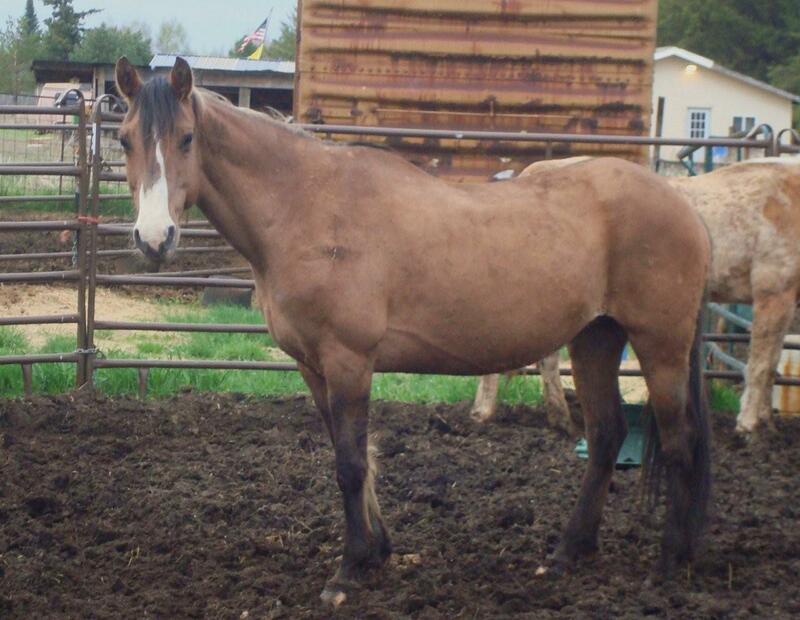 Jasper: 2008 grade Tennessee Walker gelding. 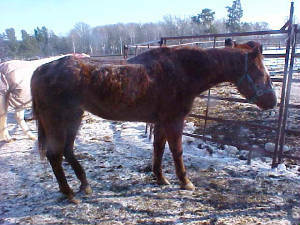 Jasper is a friendly young gelding who was in pretty rough shape (very thin) when we purchased him. These photos were taken the beginning of January, he's gained weight since then but very slowly, he still has a ways to go. I will be adding updated photos soon. I was told Jasper was started under saddle, we don't know how much/if any riding he has had and it will be a while yet before we are able to evaluate his training level. He likes people and will be a nice looking horse when he has his weight back. Update 3/19/2012: Jasper has been slowly and steadily gaining weight, he still has a little ways to go. 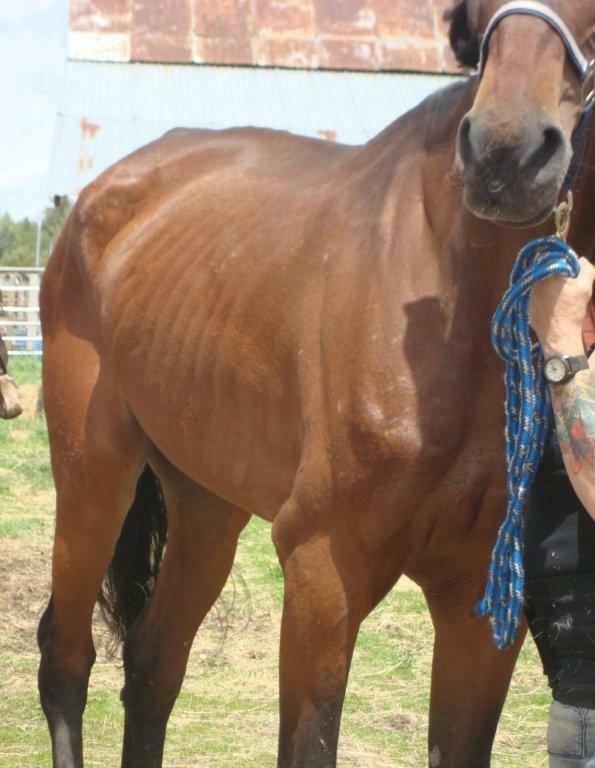 He now has a new owner who has rehabbed other horses and was willing to take him home and finish up his rehabilitation herself. 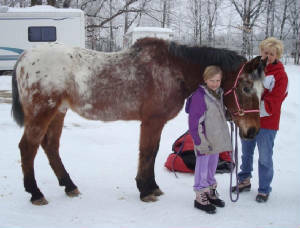 Star: 23 year old registered APHA mare. 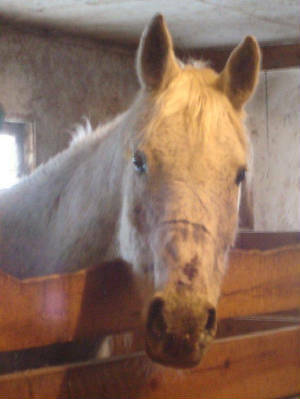 Star is a sweet, older mare in need of some TLC. She needs weight and she has a small wound on one shoulder we will be having the vet examine- there must be a chip or splinter of some sort in there that hasn't worked itself out, as we were told she's had this wound for at least 5-6 years. Photos above were taken 8/28/2011. Update: May 2012. New photos of Star, taken spring 2012. 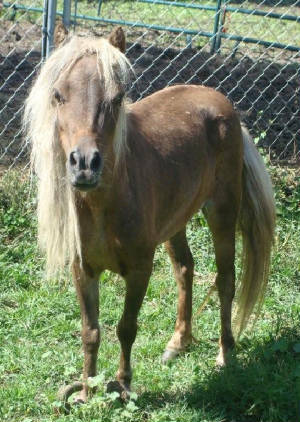 Mini mare: Beautiful little mare with horribly neglected front hooves. 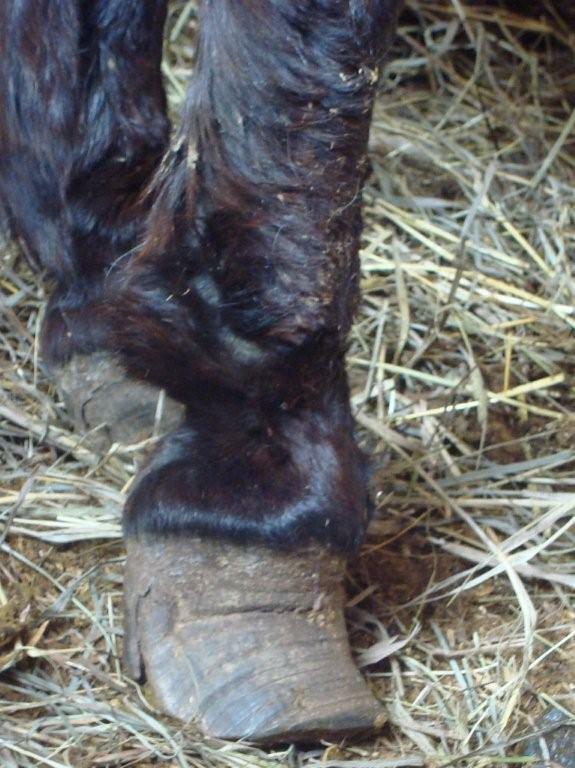 She will have her feet trimmed very soon and we will post more photos. Photos above were taken 8/28/2011. Update: Pixie's feet have been trimmed and are looking much better, though they still have a ways to go until they look normal again. Pics coming soon! 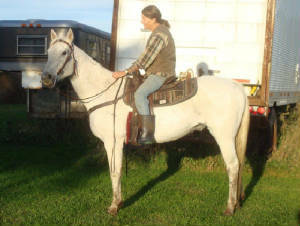 Jack: 20+ year grade QH gelding. The first 2 photos above were taken summer 2010 here, before Jack found a new home. I posted them to show what he looks like with good weight, (and hopefully soon will be looking like that again). 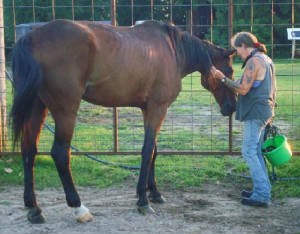 The 3rd photo was taken 7/29/2011, after Jack came back to us. He had a home with a very nice family over the winter but unfortunately contracted an infection and lost a lot of weight before they got him healthy again. They were very concerned about him and worried that he wasn't gaining weight back at a good rate so contacted us to see if we'd be willing to bring him home and get him back in shape. Jack has a great appetite and hopefully it won't be too long before he's back to looking good. 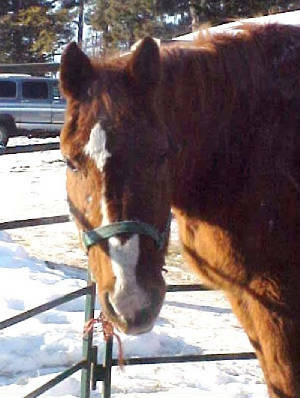 He is a wonderful older gelding, a rock solid trail horse and honest as they come. Jack will be looking for a new home when he's ready to go, (and he will always need extra feed to maintain a good weight). 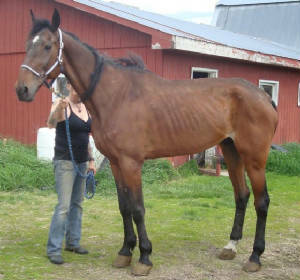 Update: After gaining most of his weight back, Jack found a home late 2011. 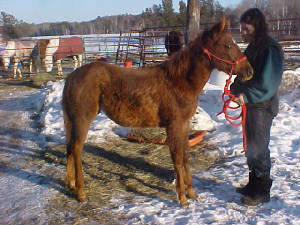 Noble: Teenaged Standardbred gelding. Very thin. 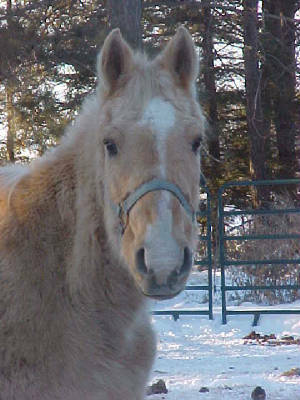 Tall, gentle gelding, former harness racing horse. Photos taken 5/28/11. This guy doesn't appear to have any issues other than needing a lot of weight. Very kind eye and is a gentleman. We were told in recent years Noble was used by the Amish. 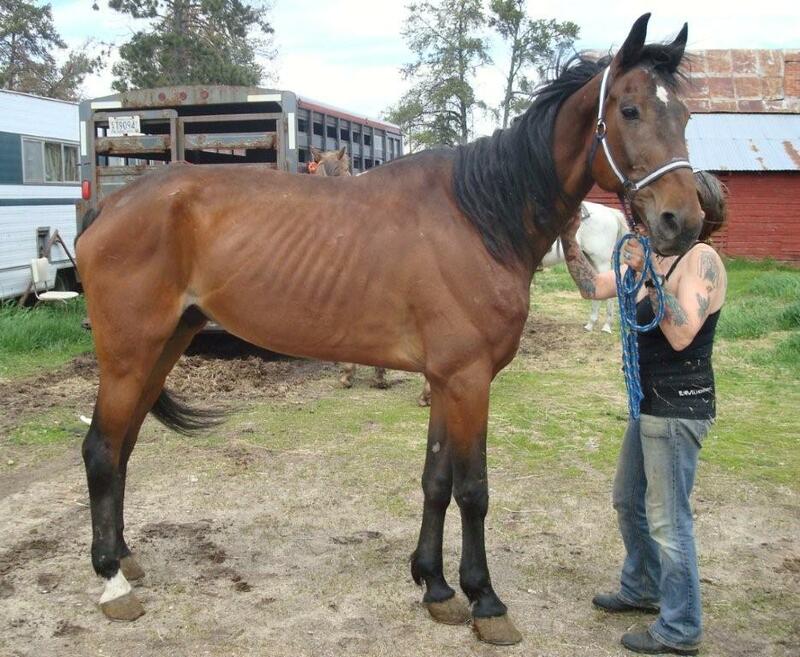 Update 7/28/2011: New photo of Noble taken today. He has gained a lot of weight but still has a ways to go, he has such a huge frame it's going to take a while for him to finish gaining all his weight back. He's doing very well and is still a complete gentleman to handle. 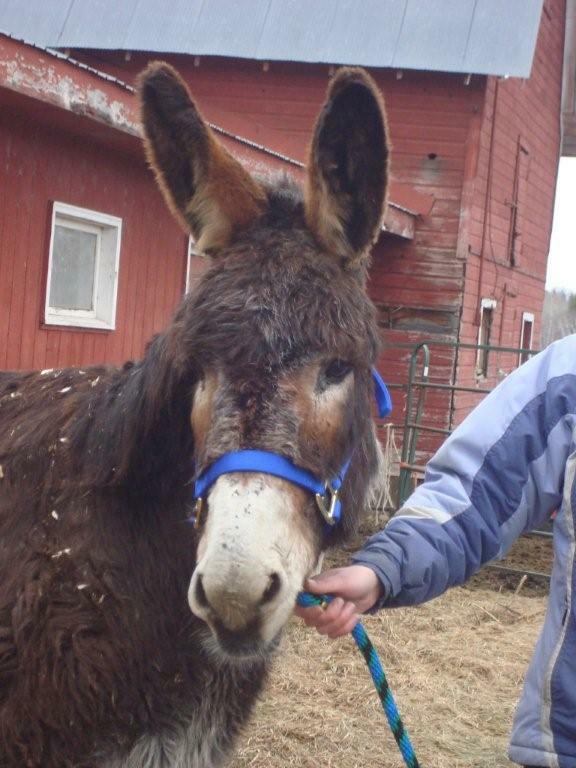 Agnes has found a home Agnes: Sweet donkey jenny in need of serious corrective farrier work. 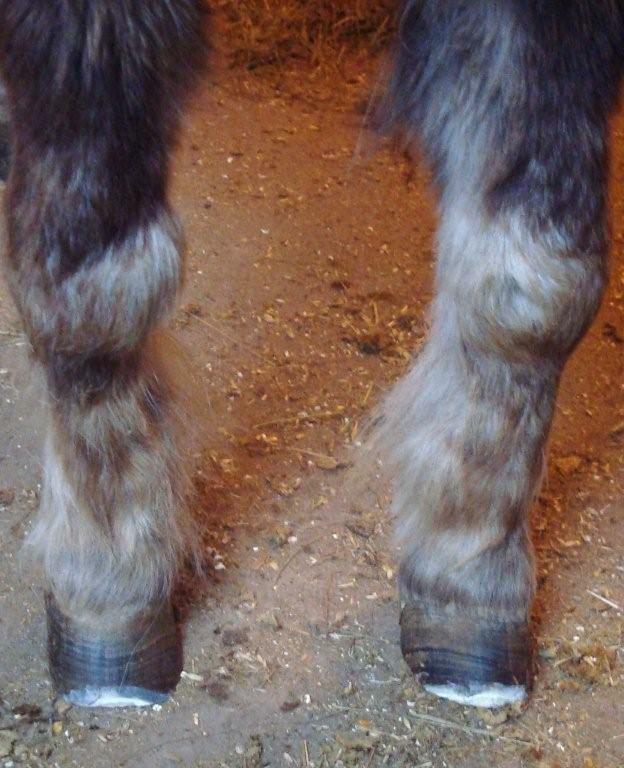 It looks as though someone let her hooves grow way too long, then hacked off the ends. They are terribly misshapen and have way too much heel. 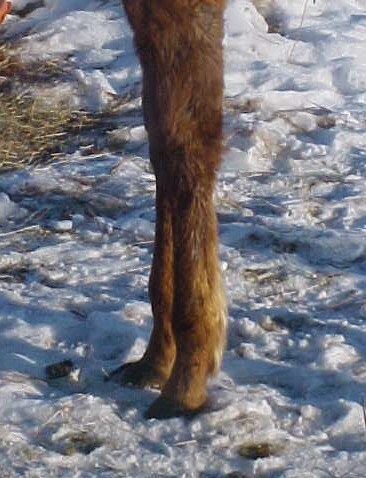 It hurts her to stand and her front legs shake and bow forward due to the angle of her feet. 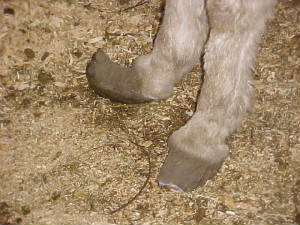 The photos of her hooves (above) were taken 2/28/2011. Since then she's been trimmed once. It will take some time to get her feet trimmed correctly but already she's standing up for longer periods and her legs are less shaky. Agnes is a determined girl and we're optomistic that soon she'll be much more comfortable. Agnes leaving for her new home, 3/21/11. With only one trim so far she was already walking much more comfortably and no longer laid down for long periods during in the day. 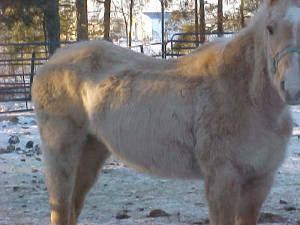 Silver: 4 year old Shetland pony gelding. 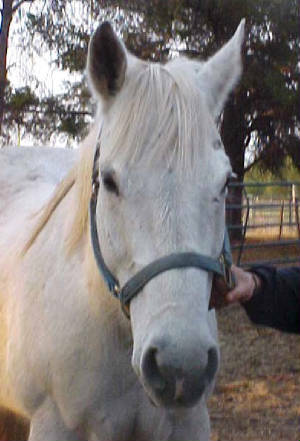 Silver is an adorable little gelding. His front legs are quite bow-legged, we think due to a birth defect. He is an active little guy though and gets around very well. 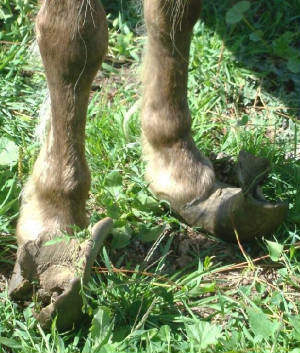 Unfortunately, his last owner neglected to take care of his hooves so they are much too long and misshapen. 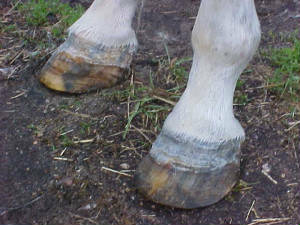 Our farrier will be out to trim Silver soon and we will post "before" and "after" photos of his feet. Update: 3/19/2011. The first 2 photos above were taken before Silver had his feet trimmed. 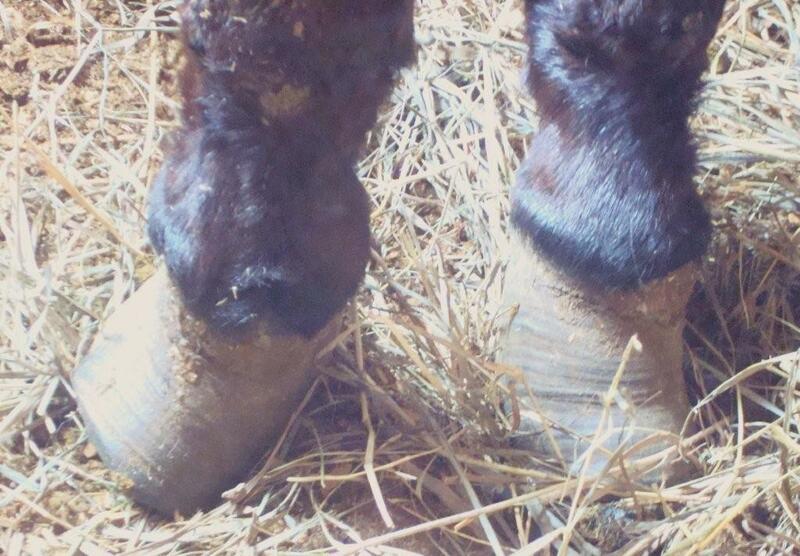 I should have taken some from the side too, to show how the one hoof was almost "rolled" to the side. 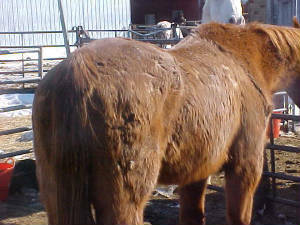 The second 2 photos were taken 3/9/11 after his first hoof trim. 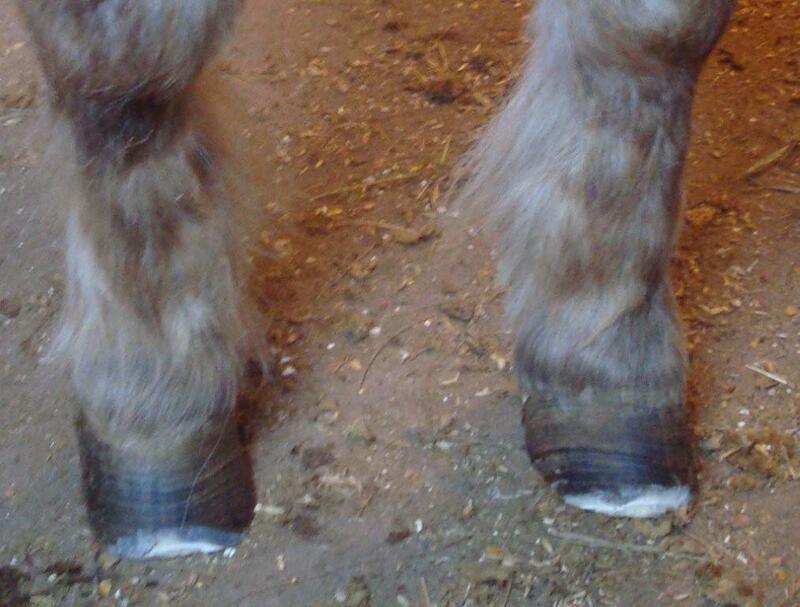 One of his hooves is pretty much back to normal, and the other is looking much better too. 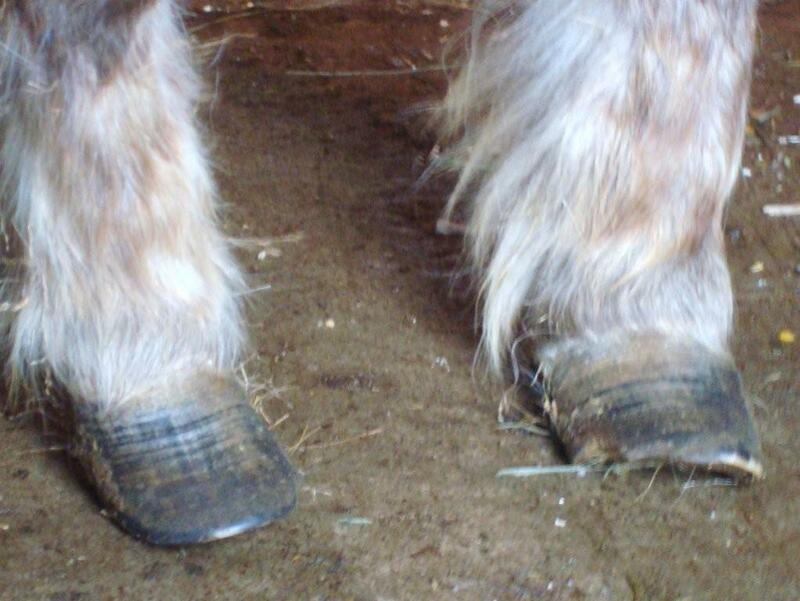 His hooves just need to continue to be trimmed correctly to keep them in good shape. The one may never be completely "normal", but Silver gets around great even with his bowed legs and enlarged knees. 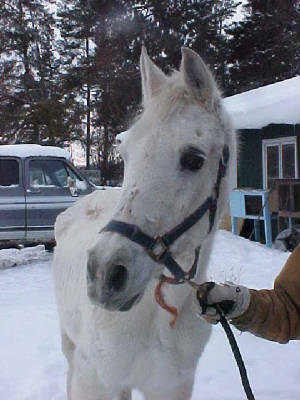 Noelle: Teenaged grey Arabian mare. 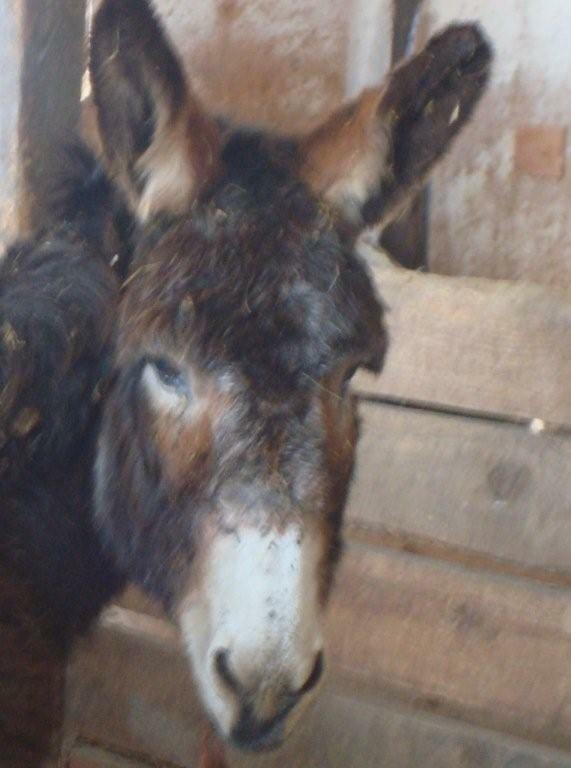 Noelle is a very sweet mare. She is blind in one eye but seems well adjusted to it. She has a small melanoma under her tail. When we brought her home from the auction in November it quickly became apparent she was dealing with "choke". We've been treating her for this and taking special care with her feed to get her through. 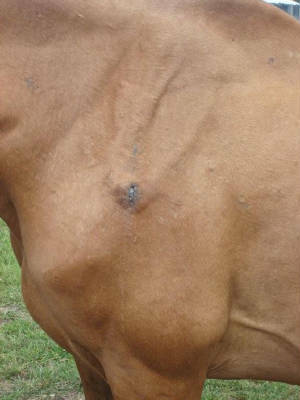 When dealing with choke for an extended period of time, some horses can aspirate feed into their lungs and end up with pneumonia. Noelle is currently on antibiotics and doing very well. She has an excellent attitude and appetite and we're optomistic she'll be just fine. 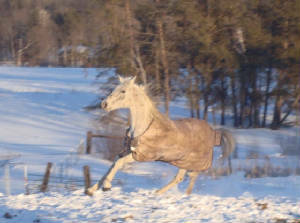 Update 2/08/11: New pictures of Noelle taken today, having fun out in a small pasture! 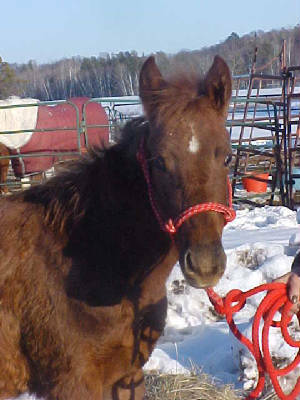 She's healthy now and doing great, ready for a new home as soon as we have her evaluated under saddle. 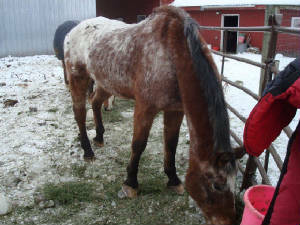 Stormy has found a home Stormy: Big, sweet older Appaloosa gelding. 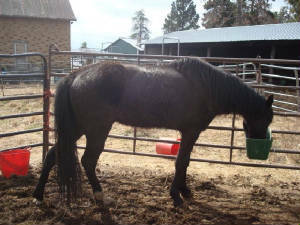 Stormy was very thin when we bought him but in less than 2 weeks time has already gained a noticeable amount of weight. The 2 bottom photos were taken 12/23/10. Stormy has an excellent appetite and no apparent health issues, we think he'll be looking good in a fairly short period of time. 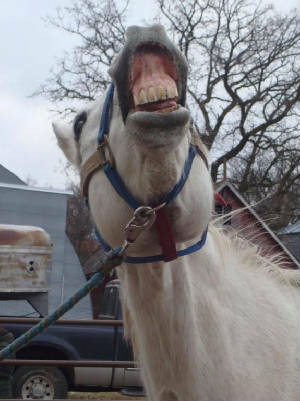 His teeth are still decent, he cleans up his hay and grain. He's very mild mannered and is a joy to work with. He's supposed to be very well broke but it will be a while before he'll be ready to try out under saddle. 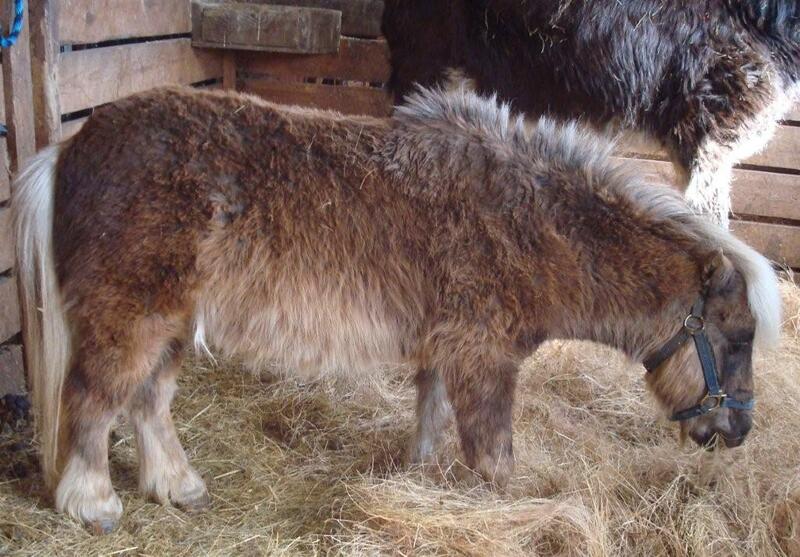 He's a tall horse and judging by his height and the size of his head, he'll be a "big boy" when he's all filled out. 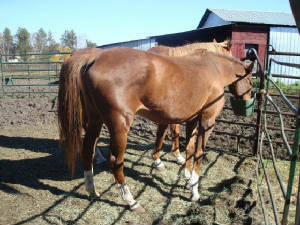 Jag has found a home Jag: 1988 registered Thoroughbred mare. Jag needs a little weight but is coming along nicely. She is recovering from what our vet feels was a sinus infection. 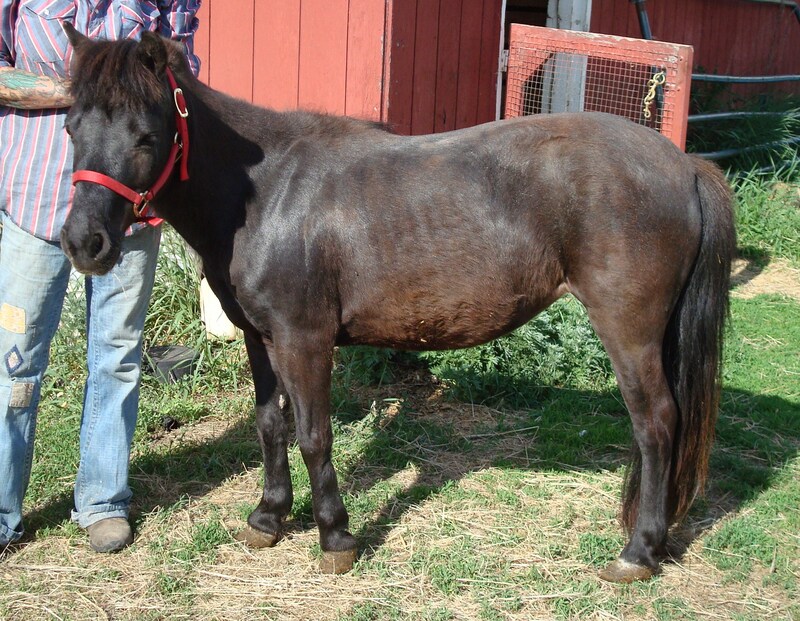 Mandy has found a home Mandy: 8 year old Mini mare. 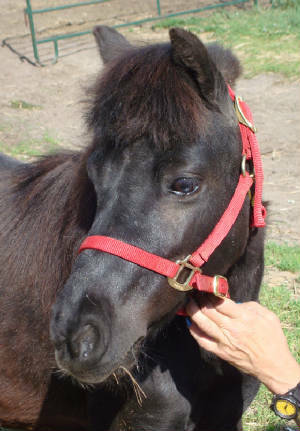 Mandy is a sweet little mare who foundered years ago. She was ridden by a small child leadline and independantly and did well. She was then sold to a new home who was very well meaning, but didn't understand how to trim a foundered pony correctly and as a result, it put her coffin bone in danger. In order to make sure she's going to be OK, she will be here until her feet grow out long enough to trim them at the correct angle. Photos taken 5/29/10. 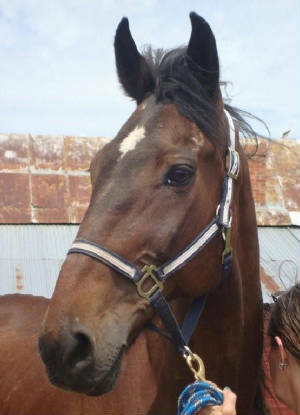 Duchess has found a home Uptown Duchess: 18 year old registered Thoroughbred mare. 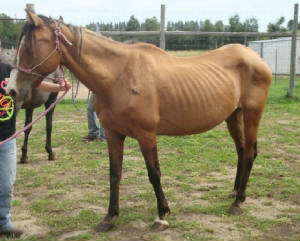 Duchess is a former racehorse who came to us in very poor shape. She appears to be sound and healthy, just needs a lot of weight. Excellent appetite and disposition (loves people). Photos taken 4/28/10. 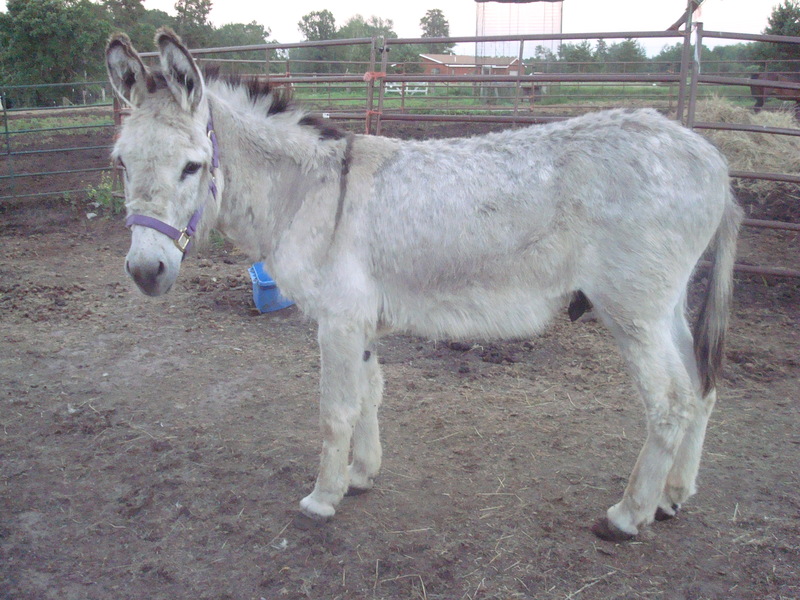 Update 8/1/10: Duchess still needs some weight but has been gaining steadily and is ready for a new home. 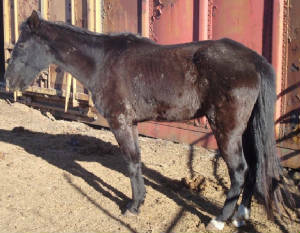 More info/pics on our "rescue horses" page. 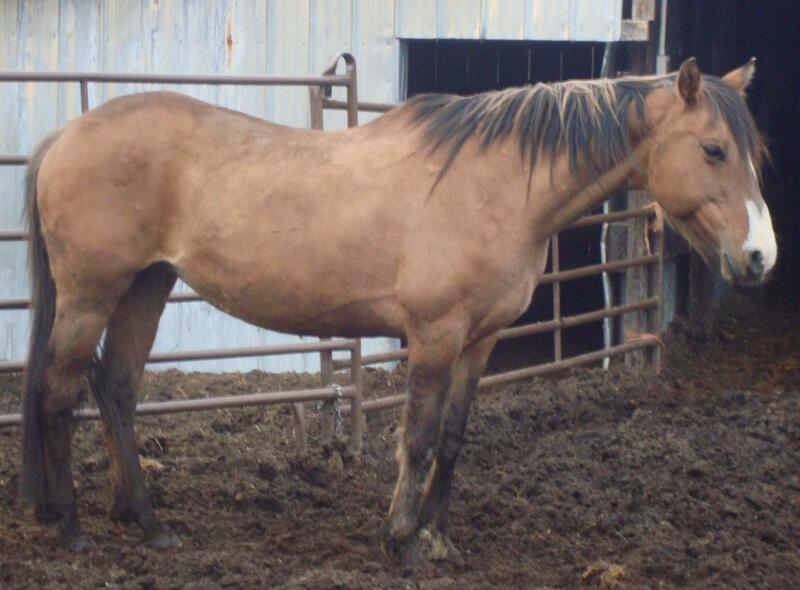 Bugs has found a home Bugs: 1987 AQHA mare. Bugs was in good shape and good health when I bought her but I'm listing her on the rehab page as she has a soundness issue that needs diagnosis/treatment. She was sold as having developed the start of arthritis in one knee last year, and she does have a limp, but we're not sure it's due to arthritis. 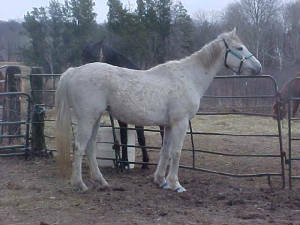 We had her trimmed today (4/13/10) and our farrier also looked at her legs and feet, we're thinking she may have high ringbone. We plan to have our vet go over her when he comes out again, and hopefully be able to make her more comfortable. 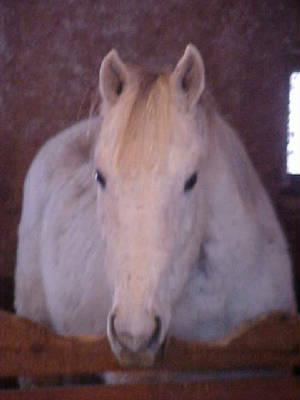 Bugs is an awesome older mare- she has over 70 AQHA youth points and was the MN "All around youth horse" one year. She's been shown in WP, HUS, Halter, Trail, and even barrels! She is a very kind mare who at best may be sound enough to tote around a child rider again, or at worst would be an excellent pasture pet or babysitter for foals. She certainly has earned a good retirement home. 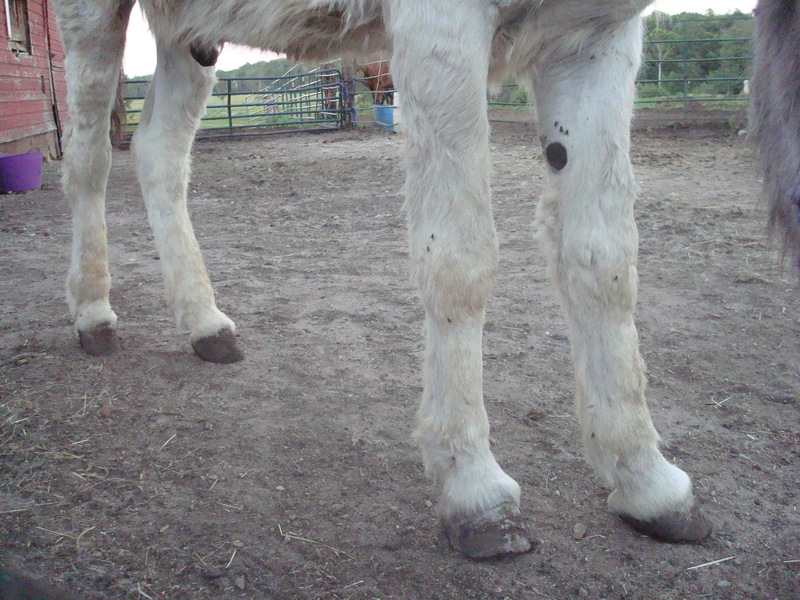 Update 6/5/10: Bugs has been examined by our vet who found she has heel pain. Someone could go farther to diagnose the exact cause, we did not have any X-rays taken though we did have a temporary nerve block done and she walked off sound with that. He said she could be a candidate for a neurectomy or corrective shoeing. 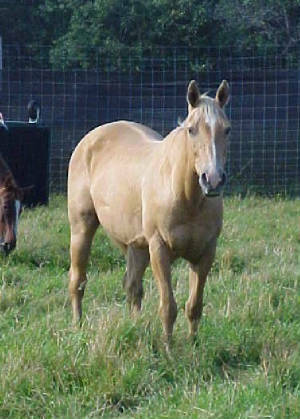 She's been doing very well here and is the sweetest mare to handle. 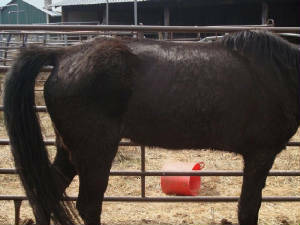 She's now looking for a new home and is listed on the "rescue horses" page. Update 6/12/10: Bugs has found a home! 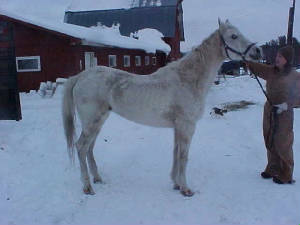 No longer available Jaleel: 1989 registered Arabian gelding. 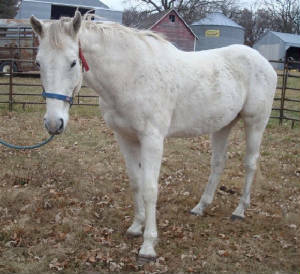 Jaleel is a sweet older gelding who has been here a while already, for some reason I just forgot to add him to the rehab page! 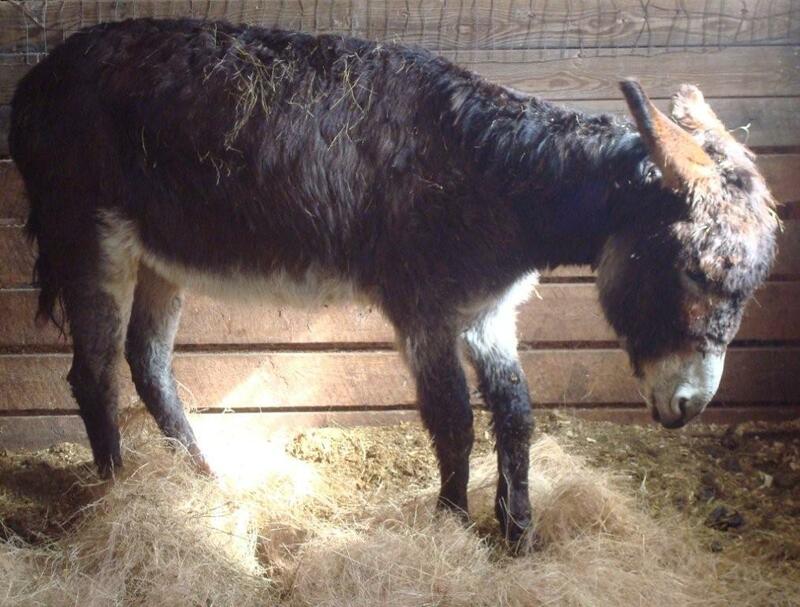 Jaleel has been foundered and we believe it's likely he also has Cushings. He needs to gain a few more pounds but nothing serious. We were told he was used for WP, and he does have a show record. 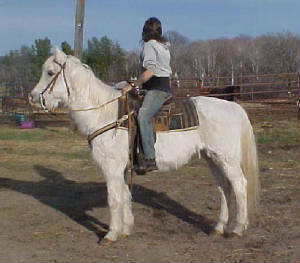 We have ridden him here once, briefly, and while he was a bit of a fart while being tacked up, he rode very calmly, stops easily, etc. He's been trimmed a few times but still has a little way to go to making him sound; he does limp a bit as one foot is still sore. Our farrier thinks that will regular/correct trimming there is no reason he should not be rideable. We will continue that here and hopefully he'll be ready for a new home soon. We don't know how much trail riding experience he's had, but we do think he might be a nice youth lesson horse. Copper has found a home Copper: Grade sorrel filly, foaled August, 2009. 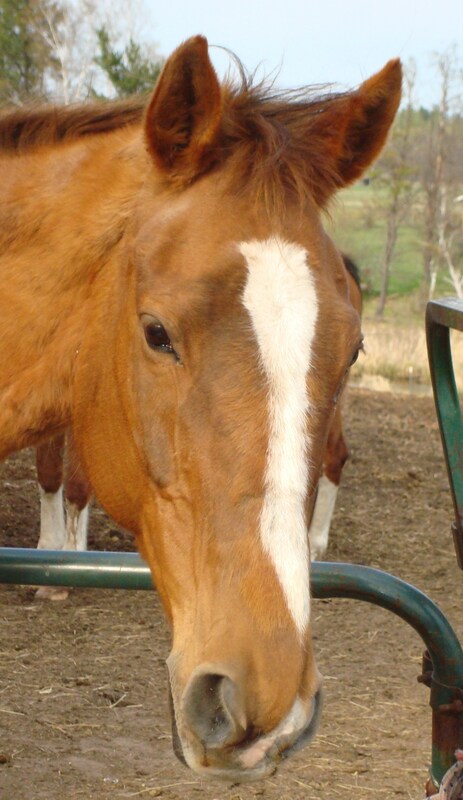 Copper's previous owner bought her at auction in November with the intention of finding her a good home. 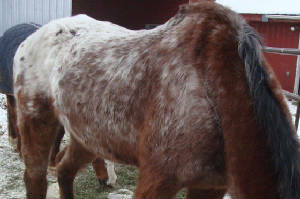 She needed groceries and had also injured a hind leg at the auction. 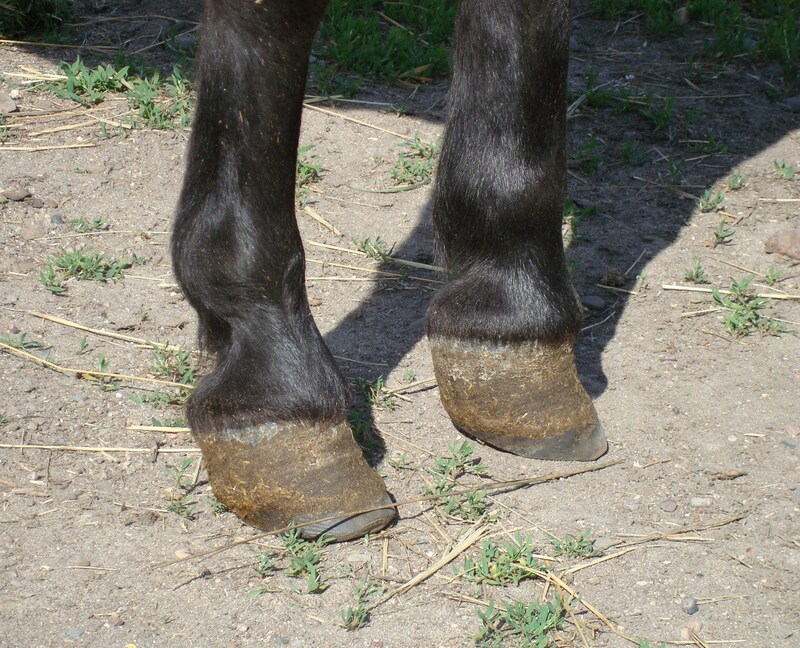 Her hind leg was treated (the pastern is still slightly enlarged but she travels sound on it) and she gained weight. She is looking good now except for the fact she is extremely upright in the front end, and she "knuckles over" at the fetlock sometimes when standing still. 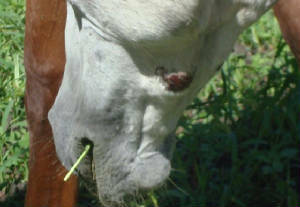 This appears to have been caused by a vitamin deficency and she is currently on a calcium supplement. Photos taken 1/15/2010. 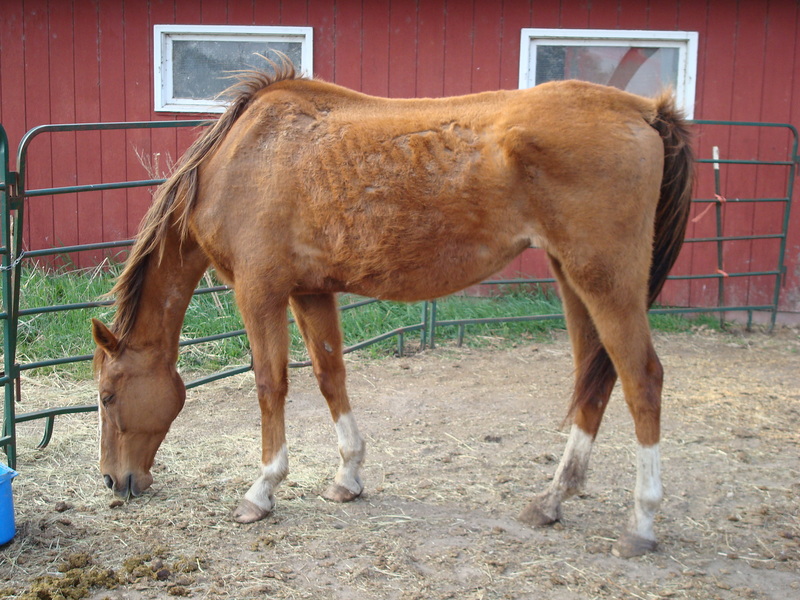 Update: 4/12/10: Copper's legs have made a big improvement, she's been doing great and now has a new home! 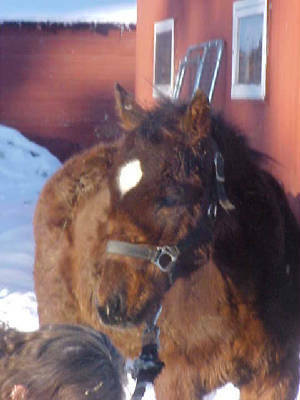 Rita has found a home Senorita: Aged sorrel Quarter Horse mare. "Rita" needs a lot of weight. She has a good appetite and we're sure we'll start seeing her weight improve soon. She looks "dusty" in the photos as she was just dusted for lice. 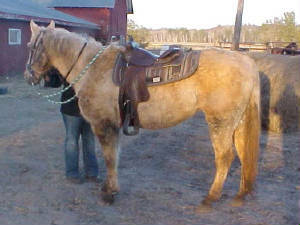 Rita is supposed to be well broke to ride, once she's in better shape we'll evaluate her under saddle. Photos taken 1/15/2010. Update 2/25/2010: New pics of Rita taken 2/22/2010. She's gained a bunch of weight and is starting to look good! Update: 3/21/10: Rita is now ready for a new home. 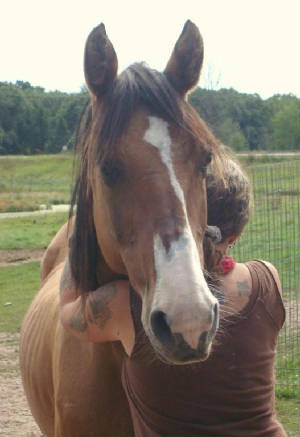 New pics on the "rescue horses" page! 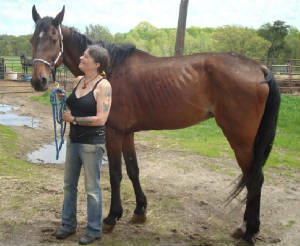 Update 4/12/10: Rita has found a home! Sea Star has a new home Sea Star: Yearling bay colt. 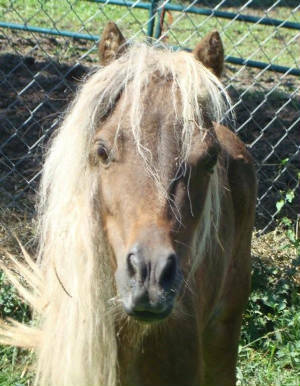 Star is a sweet little guy that needs TLC. He needs some weight and has some swelling in his joints. 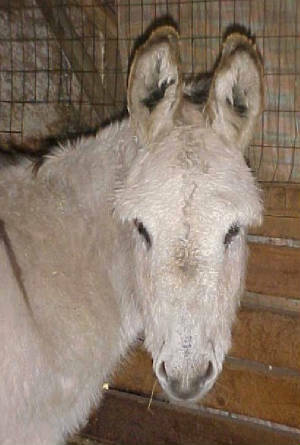 He also needs to be cleaned up a bit, (dried on mud/manure) and have his cockleburrs removed. 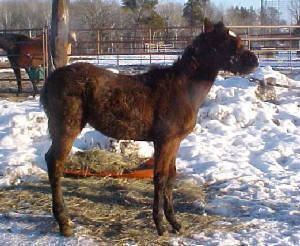 He's a pretty shy colt so we're working slowly with him. Photos taken 1/15/2010. Update 3/21/10: Sea Star is now ready for a new home! 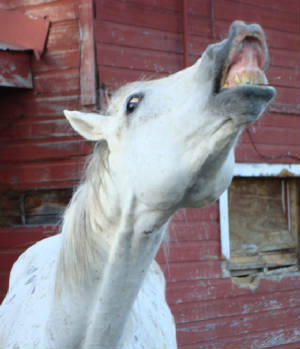 See the "rescue horses" page for new pics. Update 6/13/10: Sea Star has found a new home! 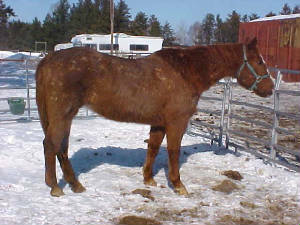 Mazey: Aged Quarter Horse mare. Mazey needs weight but seems to be sound and healthy otherwise and has a great appetite. 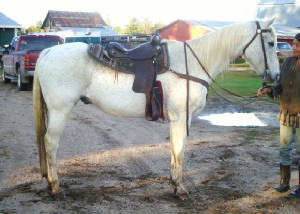 She is a nice mare and supposed to be broke to ride. 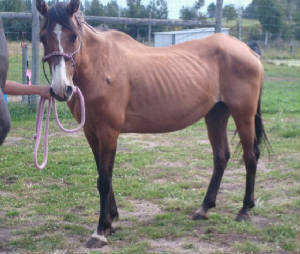 When she's in better shape we will evaluate her under saddle. Photos taken 1/15/2010. 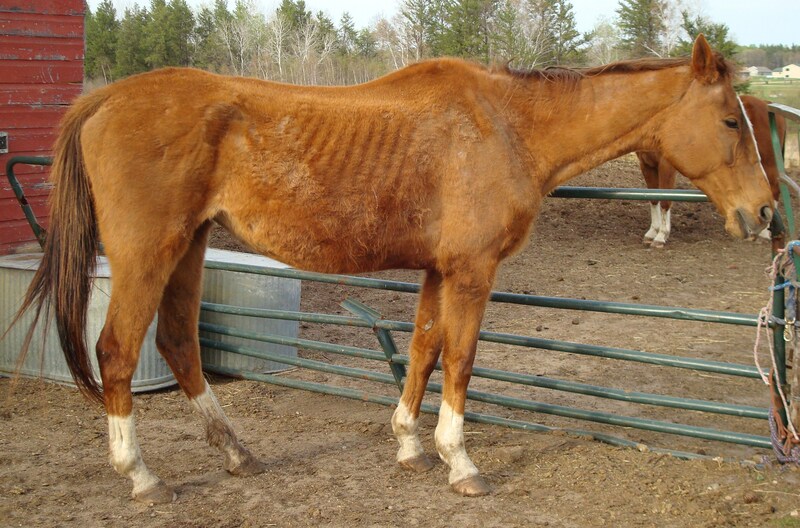 Update: 2/20/10: Mazey has been doing well and has gained quite a bit of weight already. New pic coming soon! 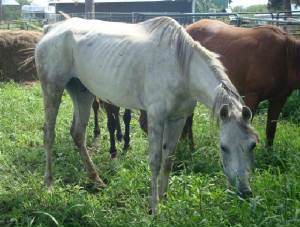 Update: New pics of Mazey taken March/2010. She still needs a little weight but is looking much better and is now ready for a new home! The above photo of Mazey was taken in August, 2010. With her weight back to where it should be, she's a good looking girl! 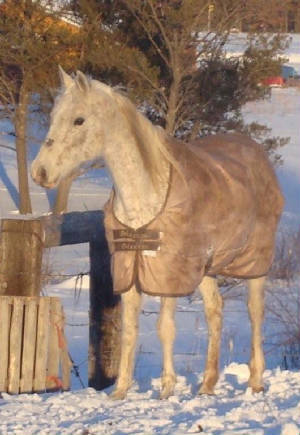 Secret Grey has found a home Thoroughbred gelding: Extremely sweet grey Thoroughbred gelding. 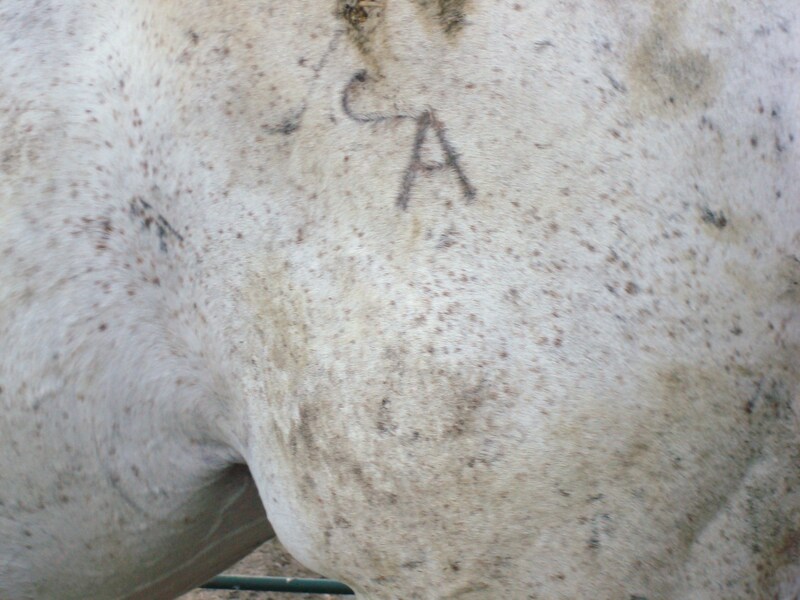 Based on his tattoo we think he is either a horse named "Badiola" or "Secret Grey". He came here with lice and could use some weight but we were told by the dealer who we bought him from that in the last 2 months he'd gained about 200 lbs there; (was extremely skinny when the dealer got him). That's the least of his worries unfortunately; his feet are in terrible, terrible shape. 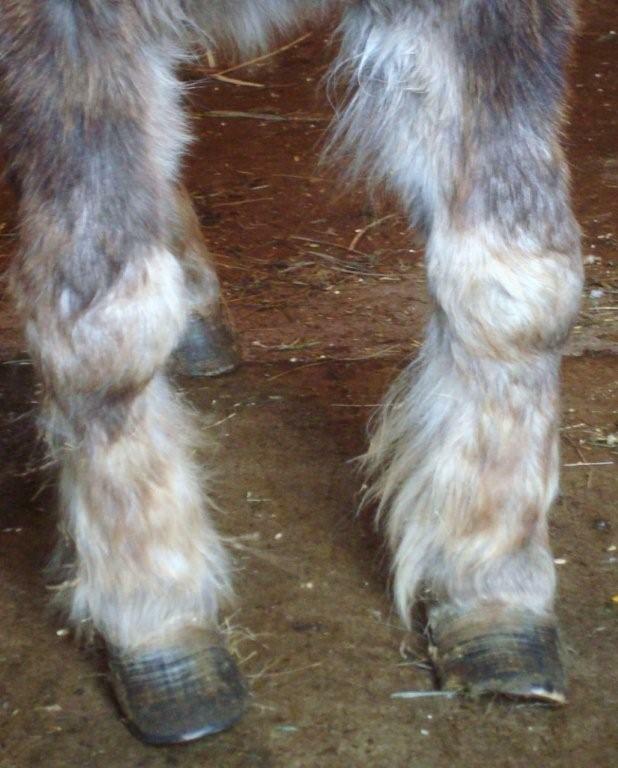 There are many areas on his hooves where you can see abcesses have blown out (top hoof photo shows one). 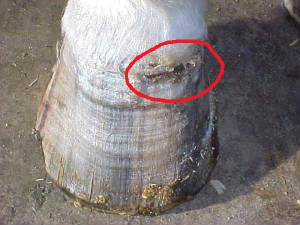 Left front has holes where abcesses have blown out through his sole, but the right front is the worst- you can see in the bottom hoof photo the area I have circled- it's a HUGE hole through the sole of his hoof. 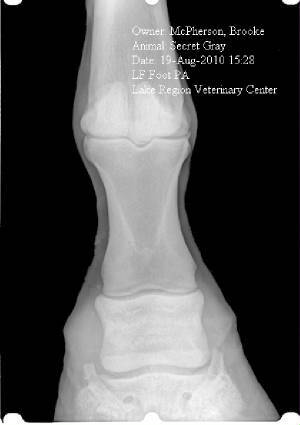 Our farrier is doing what she can for him and his feet are clean and protected now, we plan to have them X-rayed when the vet is out again. We're cautiously optomistic that he may recover but until we know the extent of the damage we won't know if he's got a good chance or not. 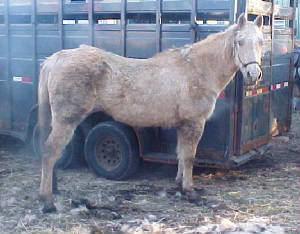 It's a rotton shame he was dumped in this condition; he is such a gentle gelding that loves people and is a star patient to work on. Photos taken 1/05/2010. Update: 2/20/10: "Mr. Grey" is doing well though he's getting tired of being stalled (I don't blame him!). 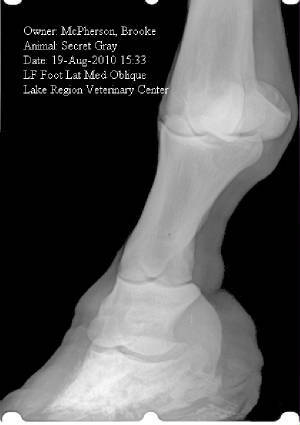 His feet were X-rayed and the vet did not see any serious damage to his coffin bone, which is wonderful news. The huge hole in his right front is slowly filling in. He does have a new abscess though, the first since he's come here, in his left front heel area. 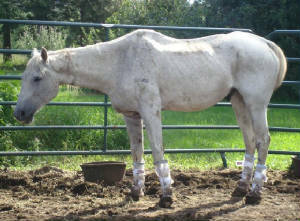 Thankfully he's still very well behaved for his hoof bandage changings and we're hoping to see more good progress soon. Update 5/24/10: Photos above taken a few days ago. Since he's shed out we've noticed the grey guy has 2 brands on him, this one and also the number 43 higher up from this, on his left hip. Turned out to play and making faces at the camera. 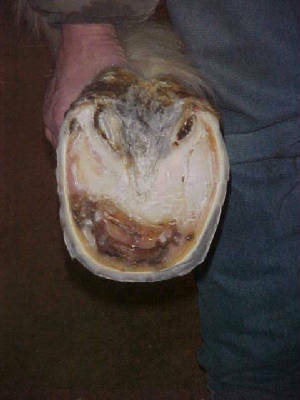 :) His original "bad foot" with the hole in it has been unwrapped now for a few weeks, the hole pretty much filled in and so far there have been no new abcesses in that hoof. 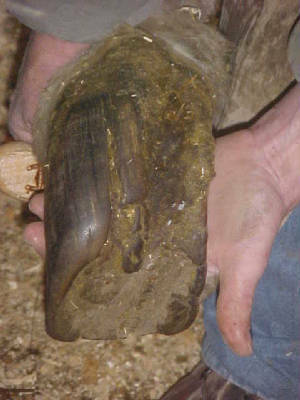 The other hoof that was pretty good to start with is still wrapped, he had another abcess that broke out around his toe in that foot a few weeks ago. Update: 6/12/10: 2 photos above taken last week, after a bath, which Mr Grey seemed to enjoy. 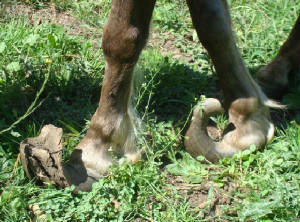 :) The hoof photo shows how much his feet have grown out in the last 5 months since we brought him home. Still having on and off abcess issues but not giving up yet. Trying something else now, the Grey guy is now turned out on clean, grassy pasture. 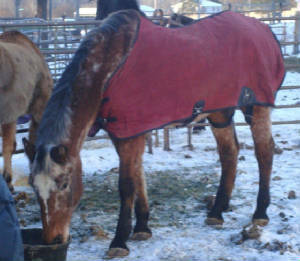 He dealt with living in the barn as well as any horse possibly could but boy, is he happy to be living outside again. 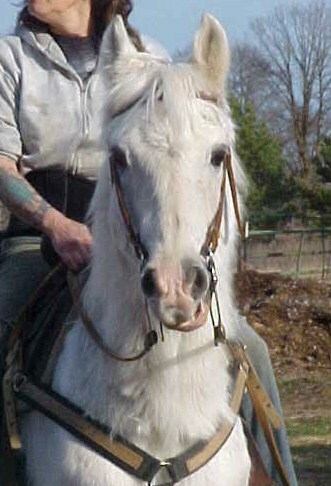 With his bath I was able to look for white leg markings to match to the possibilities I found in the Jockey Club database, and I'm confident we've ID'd him now as the 1997 gelding, Secret Grey. 31 starts, race winner. Now just to try and track down where those brands came from, would love to know where this guy came from and what he was doing in recent years. Update 8/22/10: Unfortunately, no real improvement over the last 2 months on Grey's feet. 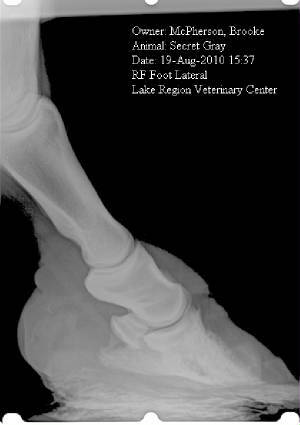 Had the vet out to take more extensive X-rays last week, (as soon as I have them emailed I'll be posting them on here). He found that there was some rotation, but again, no scary/obvious things like bone chips, etc. 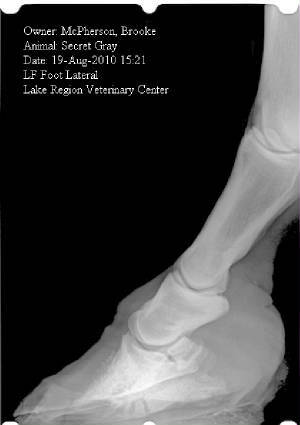 You can see infection/abcess pockets on the X-rays in both feet. Treatment recommended was heavy antibiotics to try and clear up these infections, 30cc of Pennicillin once a day, and 10 SMZ pills twice a day. He's thinking it will be a few months before we know if this is working. Prognosis is again, guarded, but we're not giving up just yet. Grey is still an extremely good patient, stands like a statue for his shots, etc. He is one of the most dignified, likeable horses I've ever met and it's going to be extremely hard to take if we find we can't help him in the long run. Update 9/29/10: These are the X-rays that were taken in August. The first three are his left front from different angles, the 4th is his right front. 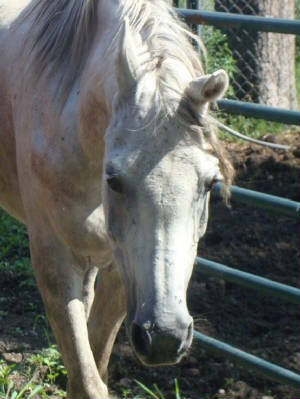 Update 11/15/11: Sorry its been so long since the last update on Secret Grey, over the last year he's been fostered by our good friend and farrier Kim Otterson. Haven't had any big news to report, his feet are still a work in progress, his attitude remains wonderful and he continues to charm everyone he meets! 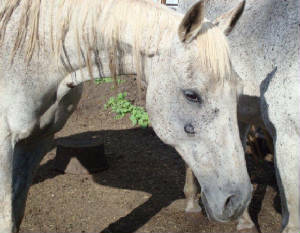 We do have a great update now: Secret Grey has found a home with a loving family who will continue corrective hoof work. The 3 photos above were taken November, 2011. First is him making yet another silly face, second standing in his pen getting ready for a "road trip" and third is loading onto the trailer for his new home! 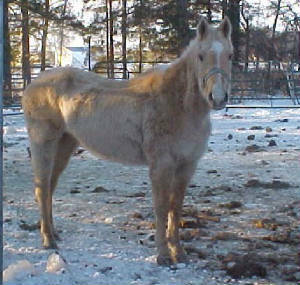 *Neriadna: 1982 registered Arabian mare. 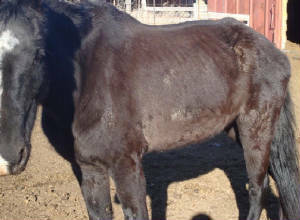 Neri is a sweet old mare in need of a lot of groceries and TLC. She is currently in a wonderful foster home starting her rehabilitation. Photos taken 12/30/2009.